Realtime Gaming has been around since 1999, and they are known as the top software provider for players from the United States. If you’re an online casino player from the US, then you’ve got to be familiar with the Realtime Gaming software. While they have players from all over the world enjoying their games, virtually all industry experts agree that RTG is the top option for US players because so many software companies do not allow players from that country. They have been running since back in 1999, giving them a big edge in experience over much of the competition, and they are licensed for operation in Curacao. The best casinos that use the Realtime Gaming software are those that use their full suite of games and that are trustworthy overall. Because of a scandal that happened with some brands that were popular at the time like WinPalace Casino, one group of sites that were owned by the same company and that were all running the RTG software stole a lot of money from a lot of players. This put a bad taste in a lot of peoples mouths when it comes to the Realtime Gaming software package, but they didn’t really have anything to do with it, and there was nothing they could really do to help with the way it all happened (the owners were arrested for non-gambling related crimes). Knowing all of this, the thing to keep in mind when picking out the best Realtime Gaming casinos, like the ones we recommend, is that they have a proven track record of paying out when they are supposed to. They also have a reputation for good customer service and for being operated by people who have a good reputation in the industry as a whole. There’s a lot of flexibility with RTG’s games in terms of how you can connect to play. For Windows-based PCs, if you’re going to be playing on the same computer over and over, then the best option is the downloadable software. The graphics are a little better than the other options, though it’s hard to tell without looking at screen shots of each side-by-side. The only option for Mac or Linux players, however, is the instant play option. This platform runs in your web browser and does not require you to download anything. You can also use it on Windows-based PCs if you like. Players who want to play RTG’s games when they are out and about can do so with their flexible mobile platform. It runs in your mobile web browser, so there are a lot of different tablets and smartphones that it will operate on with no problems whatsoever. This includes iOS, Android, Windows Mobile, Blackberry and other mobile operating systems. The downloadable option has the most games and the best graphics. However, it’s only available for Windows computers, and the games have to download individually from that platform before you can play. The instant play option has much more flexibility in terms of which computers you can use, and it’s a good option for public computers as well. The main disadvantages are that the games take a while to load, and some of the games in the downloadable option aren’t available in instant play mode. Mobile players can take their play with them much easier than those who use the other two platforms, and it’s very flexible in terms of which types of mobile devices you can use. Howver, it has the same game loading time issues as the instant play option, and the same issues with fewer games being available. Most people these days prefer the instant play option, especially at online casino sites that include titles from other software providers. The slot selection is probably the main thing that most players are interested in most of the time when it comes to the Realtime Gaming software. The RTG Slot games cover a really wide range of themes and concepts, and both classic slots and video slots are available. They also have a few major progressives that pay out life-changing sums of money, and these games are generally seen as getting more than their fair share of players because of the availability of these prizes. The key group of games in this genre from RTG is called the Real Series of slots, and they’re a group of a few dozen games that have a number of things in common. They all have bonus features, and almost all of them have between 20 and 50 paylines, which gives a somewhat uniform presentation without the experience being identical between them for the players. On top of that, each of them has at least one (and as many as four) smaller progressive jackpots that you can win on any given spin no matter what size bet you make or how many paylines you play with. The largest of these is always worth at least $1,000, which is a great extra prize to have available. In terms of game quality, there is a pretty wide range that you’ll see. Because Realtime Gaming has been around so long, and because they very rarely, if ever, pull games from their line-up just to do it, you’ll see a lot of games that are very dated in terms of graphics. The gameplay values are still pretty good for almost all of these games, but you can tell a big difference between a lot of their older titles and the production value of their newer games. Their newest games are up there with the best that the industry has to offer, but their oldest aren’t even in the same league. A number of different casino poker-style games are available, and this includes some atypical games like Vegas Three Card Rummy, a game that plays similarly to three card poker. A few different blackjack games are available with good maximum payout levels for correct play, including pontoon with easy rules and a low house edge. A couple dozen different video poker games are available here, making RTG one of the best video poker providers in the industry, a distinction that many players miss out on because they’re so focused on slots. Although they aren’t really table games, RTG also has a solid selection of keno, scratch cards and instant win games. This rounds out their game selection in a pretty good way by giving players a lot of different ways to gamble and win. Their most recent games have gameplay values and a visual appeal that will match any other software provider in the industry today in terms of quality. They are available to US players, which you can’t say about most other popular providers. A great selection of video poker games is available, a selection that’s so large that only one or two other top companies can compete at all. The Real Series of slots gives players an atypical gameplay experience with the random progressive jackpots. The name is often associated with the WinPalace Casino scandal, even though RTG had nothing to do with it, which has tainted their name a bit. A lot of their slots are very dated and look pretty rough compared to their newer titles. They have a relatively limited total number of games (a little less than 200) compared to other top providers, who often have over 400. The mobile platform has an even more limited game selection than that. If you’re a US player, then RTG is pretty much the be-all, end-all of your options because they beat out the other options almost completely for the most part. If you’re from the rest of the world, however, then Realtime Gaming still stacks up well, but it’s clear that other providers have an advantage against them. Many of their newest slots look just as good as those from Net Entertainment or BetSoft, two companies known for their extremely high-quality games, which is about the biggest compliment you can give an online slot provider. However, with so many low-quality games mixed in, the message is often missed. Overall, this is a good software package if you’re from the US or if it’s mixed in with games from other providers at the same online casino. 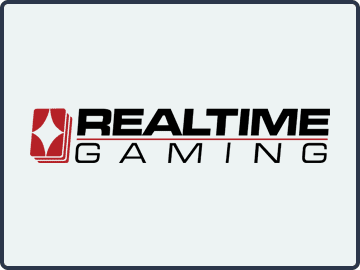 If you’re a video poker fan in particular, then RTG is a company that you should definitely be familiar with because of their great game selection for that genre.